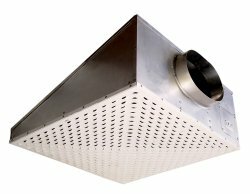 Warren Technology produces Custom Built Electric Duct Heaters for installation in commercial HVAC systems. Warren heaters are engineered for reliability and safety, and are specifically designed not to exceed safe operating temperatures. 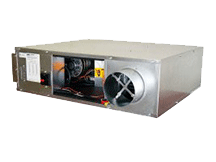 Custom built electric duct heaters are safety tested and listed by Underwriters Laboratories (UL) and the Canadian Standards Agency (CSA), and meet National Electric Code (NEC) requirements. Warren's custom built electric duct heaters have several advantages over alternative heating products. 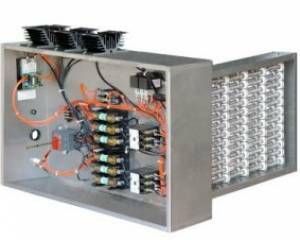 Warren offers the following products: Custom Built (CBK), Stock-Line (SL), Quicksilver (QS),Unitary Residential, Remote Panel, Bottom Mount, Flanged Mount, Discharge Mount, and Round Heaters. Completely computerized CAD/CAM engineering and our modern production facility ensures product quality, design flexibility and quick delivery. Virtually unlimited KW capacities and element size combinations ensure that any requirement can be met. A wide variety of control options are available including SCR controls. 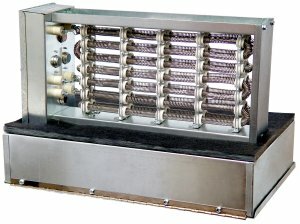 Heater KW capacities range from .5 to 1000 KW. All standard heaters are constructed of 20 gauge, or heavier, hot-dipped galvanized steel. Our modular design enables our products to be installed very easily in the field and offers easy access for maintenance. 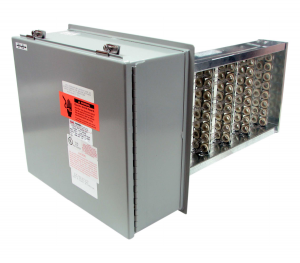 Warren Technology heaters are unique in their element selection and design. Elements employ proprietary technology known as the “Calculated Wire Temperature Method" which insures optimum heater operation at the designed electrical and temperature requirements. In addition to online quoting, you can call our quoting specialist at 1-800-327-8468 which offers a fast and easy way to specify and price any Custom Built Electric Duct Heater. Control Section can be mounted in any convenient location. 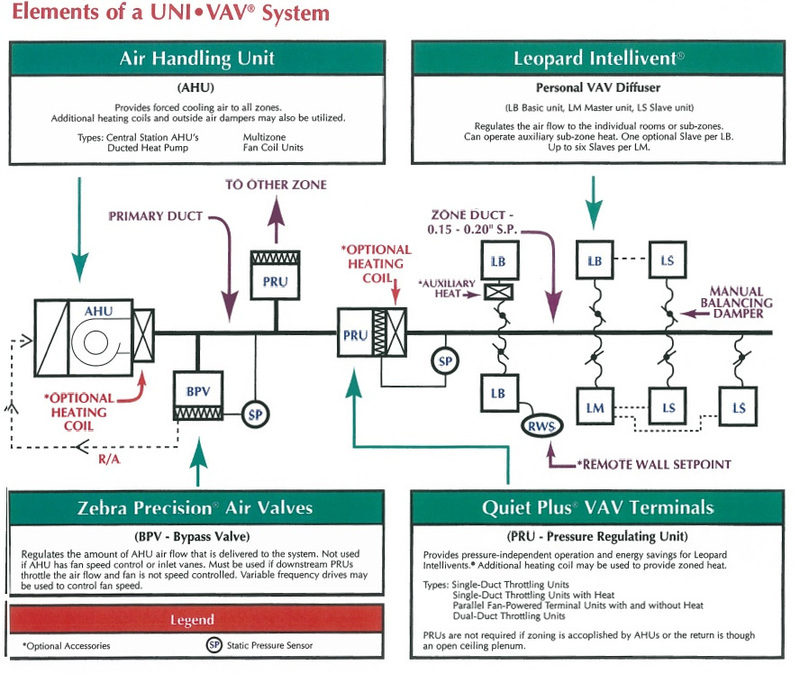 Connections between Control Panel and Heater section are easily made through the use of factory installed terminals. Heater Section available as Slip-In or Flanged Mount. 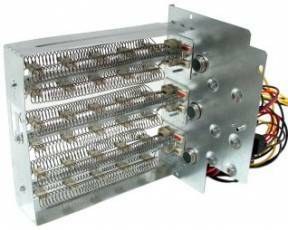 All construction features of the Custom Built heaters are incorporated in the Remote Panel Heater. 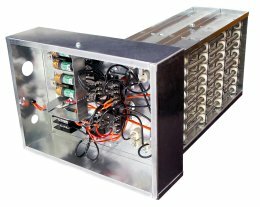 Disconnecting contactors meet UL requirements for remote location. 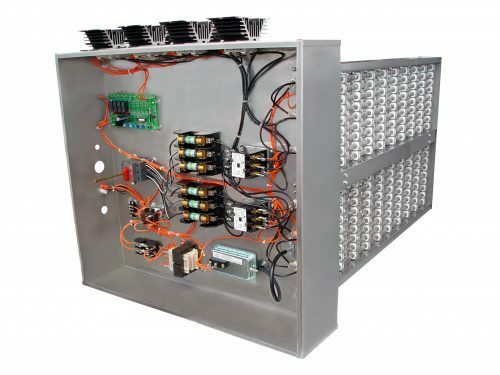 Control Panel components are completely factory wired and only the connections made between the panel and the heater need to be field connected. 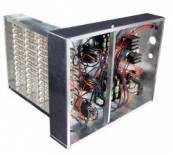 All accessories available for Custom Built heaters are available for Remote Panel Heaters. 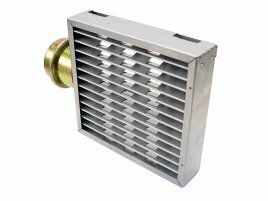 UL Listed as Bottom Mount Heater. Controls are accessible without the need to remove the heater. Factory pre-wiring of accessory components eliminates costly field installation. Provides maximum ease of serviceability in limited installation space. 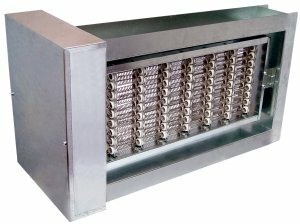 All construction features of the Custom Built heater are incorporated in the Bottom Mount Heater. Flanged Mount provides maximum duct rigidity. Standard 1" flange matches standard SMACNA duct flange. Heater flange and boxes are constructed of 20 gauge or heavier galvanized steel. Design allows virtually unlimited duct size match-ups. Deeper flange depth available where required. 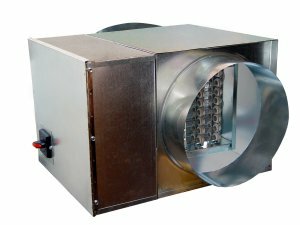 With required information regarding exact blower configuration and with proper air baffle, flange mount heaters can be close-coupled to blower units. 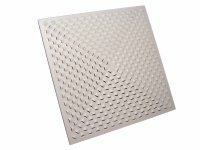 Allows an easy method of installing an electric duct heater in a round sheet metal duct. pipe connections provided at the inlet and outlet for field connection. 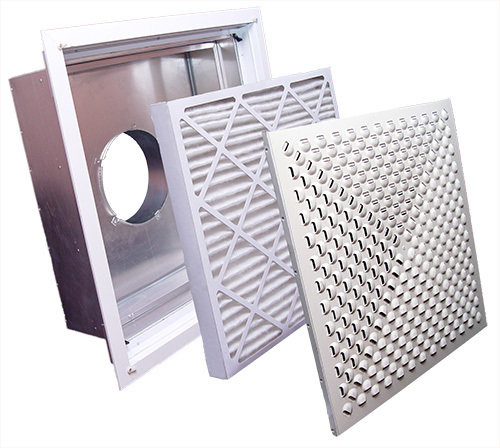 NEMA enclosures for duct heaters and remote panels are available in a corrosion-resistant stainless steel or powder construction. They are designed for indoor and outdoor use, providing protection against windblown dust and rain. These enclosures are hinged with fully insulated covers that include pressure latches on all sides.